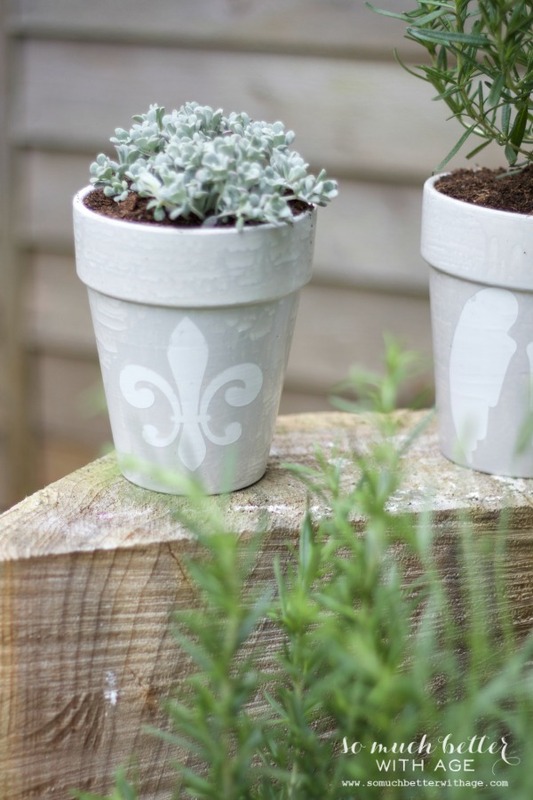 This easy tutorial will show you how to make lovely French glazed plant pots. 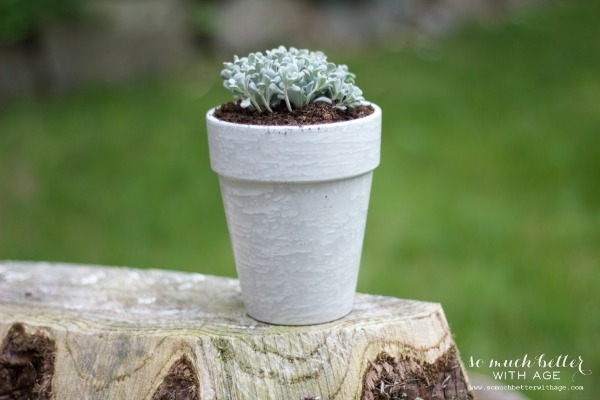 One thing I really love is creating my own French style and in this post I will show you how to make your own French glazed plant pots but first I have something to share with you! 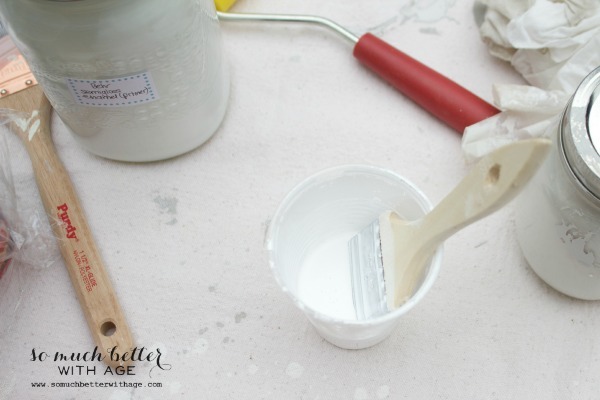 This weekend I’m going to be doing something I haven’t done before as a DIY blogger. I’m going to be doing an event at a local gardening centre with Shelley from Sow and Dipity, Tara from Suburble and Crystal from Sew Creative. I recently had the pleasure of meeting all three of these lovely ladies at a bloggers’ event last Friday that you might have seen if you follow me on Instagram. I’m planning on posting some photos soon. We had so much fun. It’s so cool when you meet other like-minded girls on the ‘internet’ but when you actually get to meet in person it’s even better, obviously. 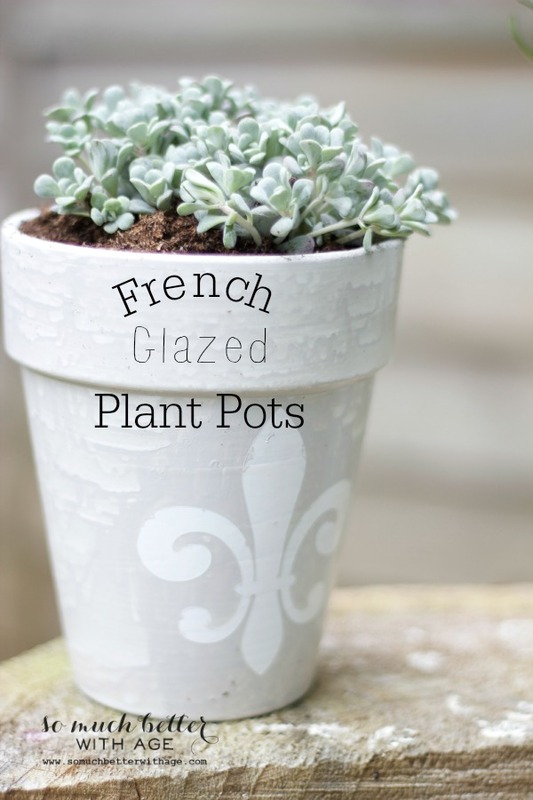 I call this project “French glazed’ because I absolutely love everything French. There really isn’t anything French about it, per se, just that the grey with the stencil makes it like something from France. First start with a terra cotta pot. 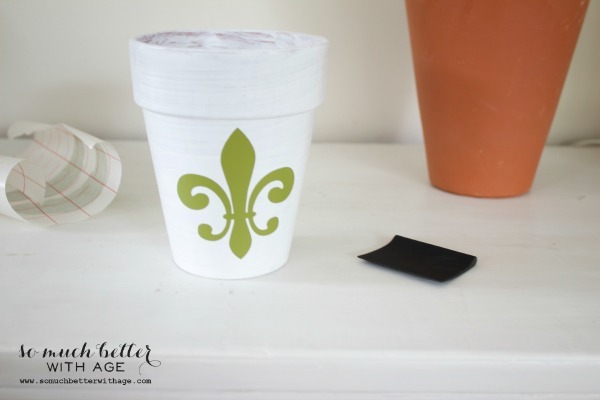 I got my inspiration from this awesome blogger, Jen from City Farmhouse. Love her. So instead of painting the pot with spray paint like Jen did, I glazed it first. Mix together. It will be really runny. You can add more paint if you’d like to get more color depth. Make sure to stir it up good and you may need to give it a little stir every few minutes or so. You can use a chip brush or a good brush. Dip your brush in the paint and just paint it on. It will be runny but that’s okay. You can brush over a few times until you like the way it looks. When you set it down to dry, the paint will run and leave marks. That’s okay. Wait for it to dry. Add another coat if you’d like. 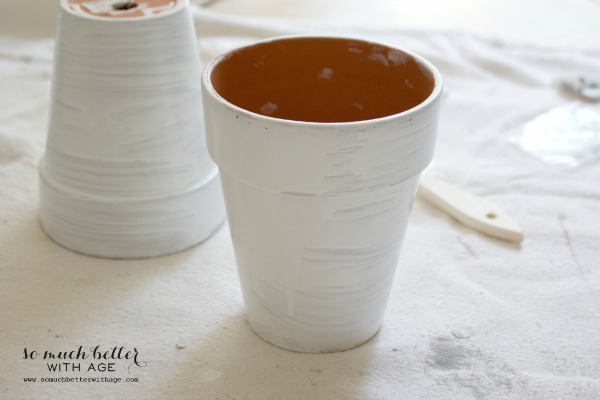 When it dries, it will look like a glaze (like you fired the pottery yourself in an oven, seriously) rather than just a regular ol’ paint job. 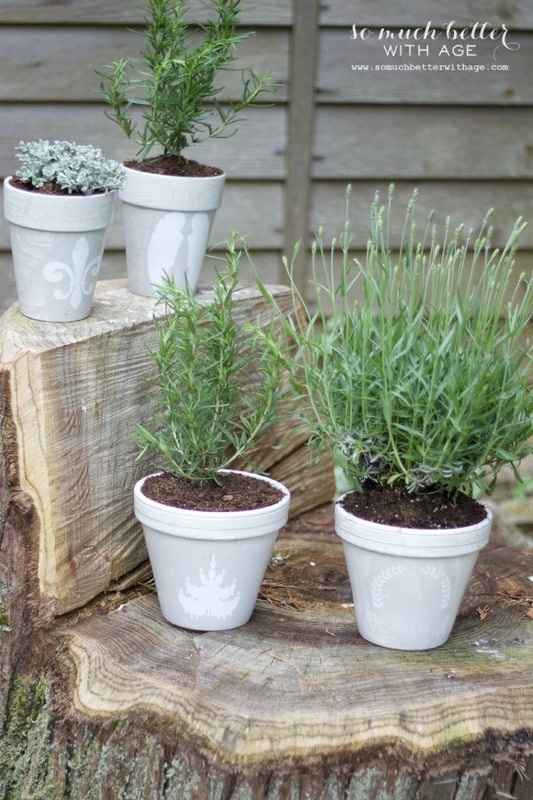 Next I wanted to add a graphic to each pot so I downloaded and cut some images via my Silhouette Cameo machine. 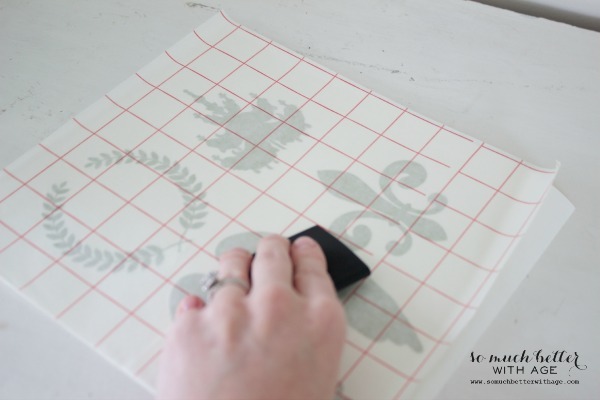 Note: If you are not using stencils like this, you can always stencil over the finished pot with a regular stencil and white paint. I’ll leave more details below. Next, press transfer paper over them. 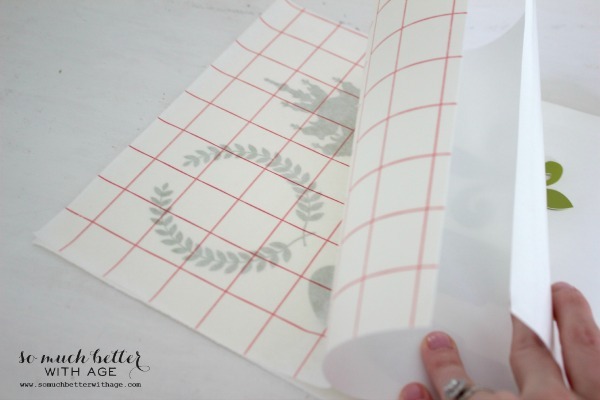 Peel the transfer sheet away from the vinyl sheet and the graphics should be stuck to the transfer sheet now. Press each image firmly over each pot. 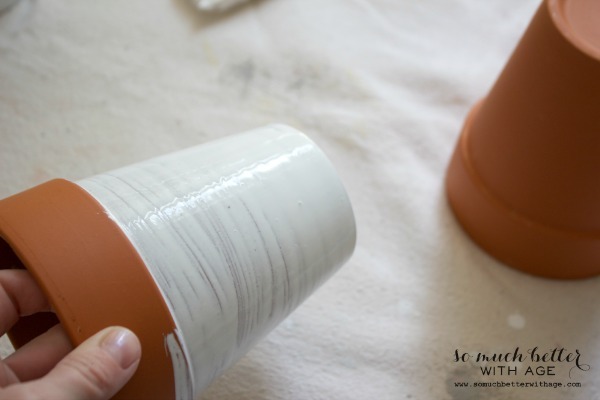 Next you’re going to mix another glaze with using the grey color. Paint this right over the image and the entire pot. 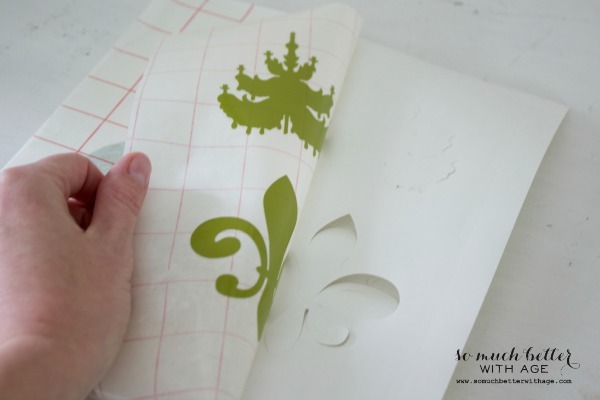 Once it’s nearly dry, pull your image off with a weeding tool (that fancy hook thing). 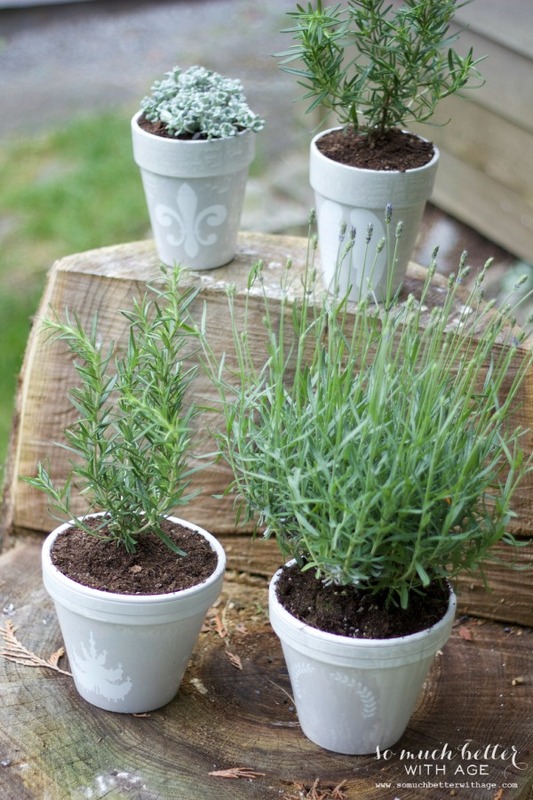 On some pots I spritz them with water just like Jen’s tutorial. It has such a cool effect! 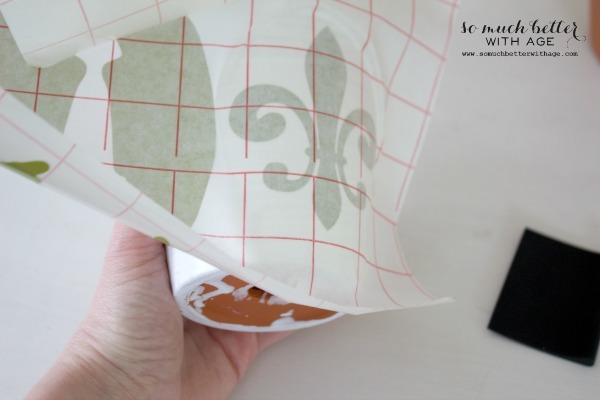 If you are using a regular stencil, you can place your stencil over the finished pot and secure it in place with painter’s tape. 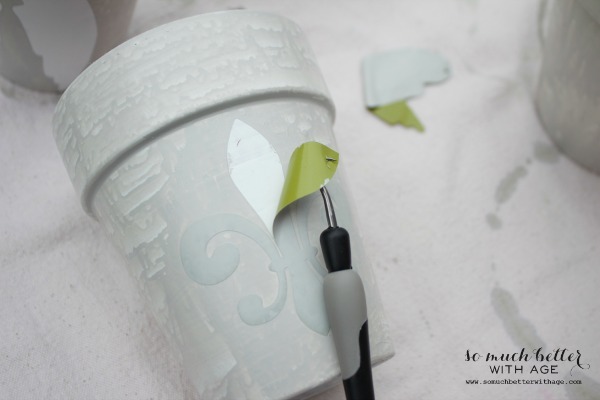 Using a foam pouncer (round foam brush) and white paint, stencil in the area on the pot with the paint making sure to wipe excess paint off first onto a paper towel and use an up and down motion so the paint doesn’t bleed underneath the stencil. 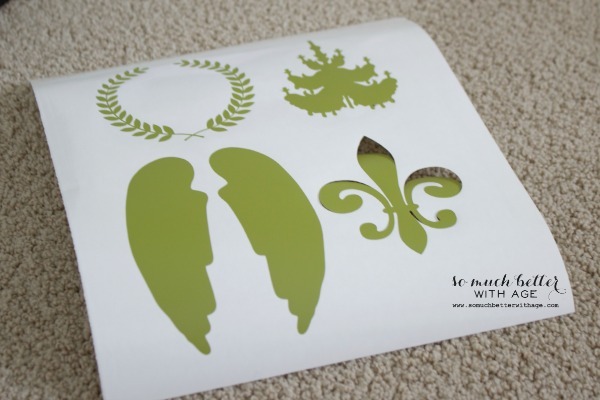 I used a fleur-de-lis, angel wings, chandelier and laurel wreath. 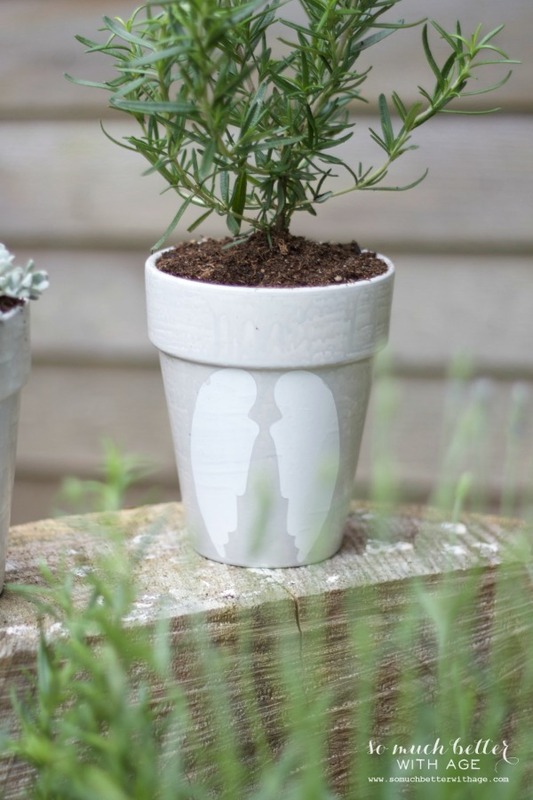 Why not try to make your own French glazed plant pots! I have a few more pots to finish up in the reverse, grey first then white. I’ll be posting them on Instagram at the big event. These are absolutely beautiful Jamie! 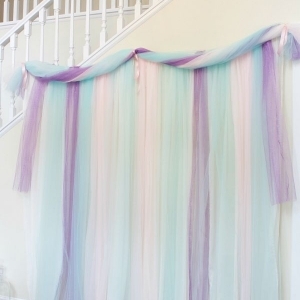 Good luck at your event – I’m sure you will be fabulous! These are fantastic! Jamie – they looked just as good in person! It was so much fun to see you again today; we’ll have to make it a habit! Thanks Tara, it was such a great event! I loved yours too. Yours are way cuter than mine!!! Love them!!! No way 😉 Thanks Jen!! 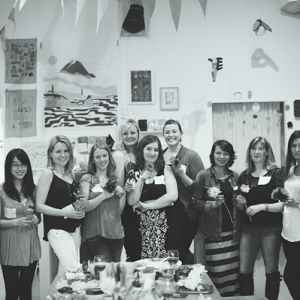 Thanks for featuring them on your blog, Shauna! I love how these turned out! Thanks so much for sharing them at the Knick of Time Tuesday Vintage Inspiration party! Be sure to “like” Knick of Time on Facebook, so I can promote your blog and FB page there! Gorgeous. Going to have to try this! Found you via Fabulously Creative Friday and definitely my first like! So glad I inspired you! 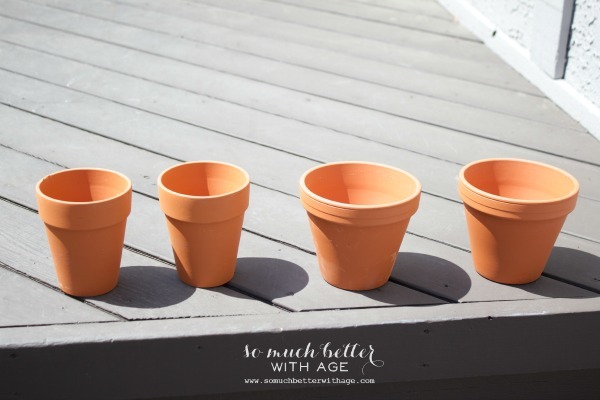 Love this little project Jamie! I need to figure out how to use my Cameo more. Thanx for partying at my place! What a great tutorial!!! 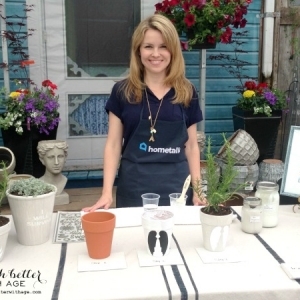 I hope the demo at the Garden show went splendidly. I love the pots, they came out just gorgeous. 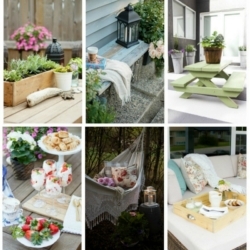 I am featuring tomorrow and definitely pinning! 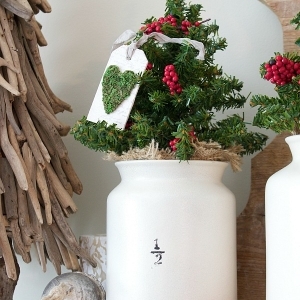 Thanks for sharing at redouxinteriors! 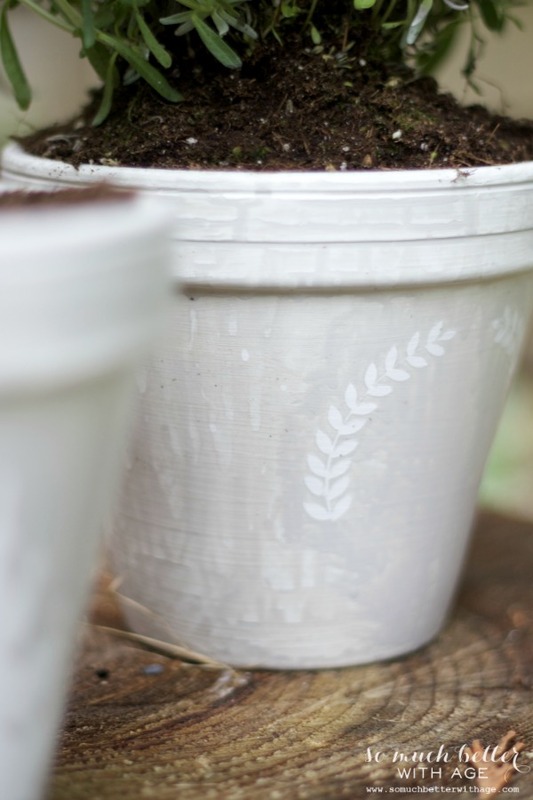 Your glazed pots are so cute Jamie. I hope your event was a success and that it was puke free for you – lol.